Joe is a Hughson native who has been battling leukemia since July of 2010. As of January 2011, Joe has been in remission but unfortunately, in January of this year, it was found that Joe’s leukemia had returned. Joe is in need of a bone marrow transplant and fortunately his sister, Jamie, is a perfect match. Jamie approached us asking for assistance with living expenses for Joe during the transplant. We were more than happy to offer our assistance and are praying for a positive outcome for Joe and his family! 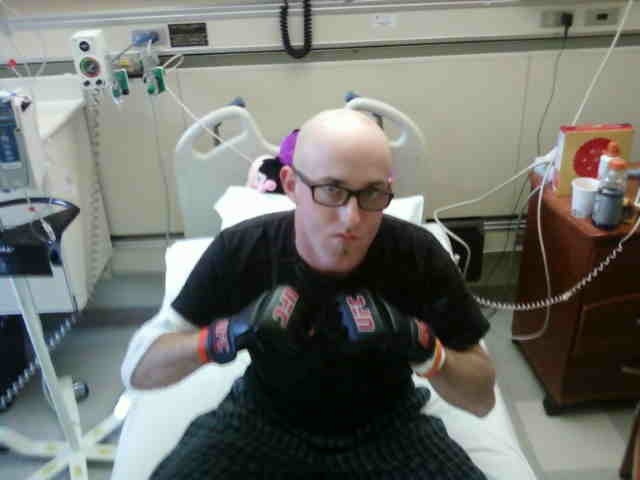 Below is a picture of Joe wearing a pair of UFC fighting gloves given to him by a close friend. They represent Joe’s determination to continue the fight against his leukemia.